Audiobook Week 2012 – Listen Up! Audiobook Week is coming! Audiobook Week is coming! Okay, so, it isn’t coming all THAT soon, but I would like to get it on everyone’s radar, especially because between now and then I’ll be thinking about moving and having twins in addition to focusing on Audiobook Week. But still, it is coming! This year, due to the lateness of Book Expo America, Audiobook Week will be held from June 25-June 29th, as a last hurrah for June is Audiobook Month. This year Jen from A Book and A Latte will be joining the Audiobook Week team as the Editor of Prize Fulfillment (so you all still get your prizes if the twins come early). If you aren’t familiar with Audiobook Week, this is an event I hosted in both 2010 and 2011. I post an audiobook review every day for that week, and encourage other bloggers to do likewise and to link those reviews up daily. Thanks to some very generous audiobook publishers, we have prizes to award to those who participate*. Posting audiobook reviews is not the only way to participate, either. At least two weeks before the event I will be announcing the Audiobook Week daily discussion topics. Bloggers are encouraged to write about any and all of the discussion topics that interest them. As with the reviews, discussion posts that are linked up with that day’s topic make the blogger eligible for prizes. Simple, really! If you need more audiobook goodness in your life between now and then, don’t forget to check out my weekly audiobook feature Sound Bytes, which includes a roundup of other bloggers’ audiobook reviews, and the Armchair Audies! 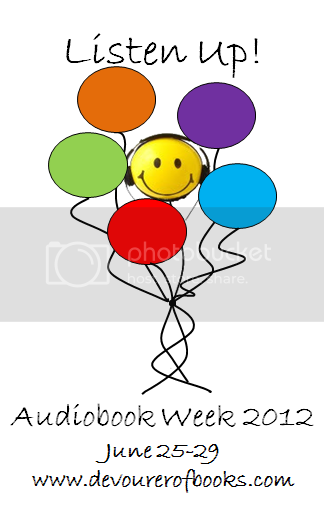 *Publishers, if you are interested in donating audiobook prizes to Audiobook Week, please email AudiobookWeek@gmail.com. 27 comments to Audiobook Week 2012 – Listen Up! How Exciting! I’m writing up a post for the Audio Book Challengers right now! OMG how cool. I can not wait. I am so new to this event but I like it already. I really want to increase my audio book listens, so I’ll be prepping for this one! Okay, I’m adding this to my calendar today. I have a ton of audiobooks on my MP3 player, this gives me the push to start listening more. I’m so glad you’re still planning to do this (and that you have help with the babes on the way). I’ve been listening to lots of audiobooks this year, so I will be looking forward to joining in. Yay…I can’t wait!!! I posted a Save the Date post yesterday. I also realized that I never joined the Audio Book Challenge, so that post will be going up later today! As I was perusing your sight, I came across the Sound Bytes meme and decided to join that as well – I’m always looking for recommendations on audio. Count me in! My favorite format, I’m already stockpiling. Yay! I’m excited for Audiobook Week, and to be helping out this year. Yay! I love audiobooks! I hope that Canada will be included for the giveaways!! Regardless, I have the badge up in my sidebar. I hope so too. I’m not mailing anything out with the twins coming, so it will all be up to the publishers and their rights. Sooo looking forward to this! Thanks for hosting! I’ve had the badge up for so long, I was afraid I’d missed the actual event! Trying to get some posts together now. Have listened to tons of excellent audiobooks, but never get around to reviewing most of them. You’re in good company, I’m still working on my backlog of audio reviews for next week, too.